The idea behind the poster was to create a positive and affirmative imagery of women in social communication. The painting was created after the Rheo Summit. The caption was determined first. The idea was to celebrate earth. The painter at that point in time was greatly influenced by the Narmada Bachao Aandolan, especially Medha Patekar in her active role of a transformer and protector of nature. 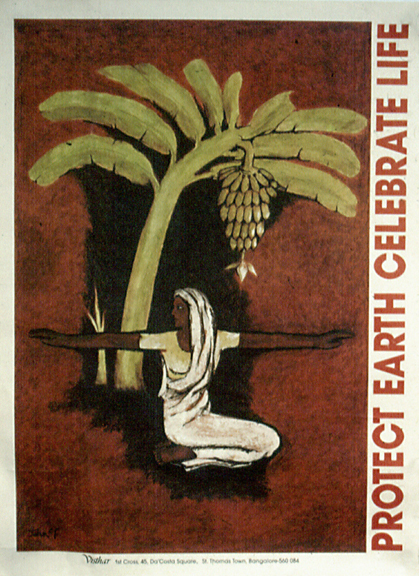 The image of the woman is the re-appropriation of the Greek mythic image, Goddess Isis transformed as Medha Patkar. She symbolises the role of a woman as a protector of nature. Thus the idea of woman is superimposed with mother earth in the context of protection, equanimity and nurturer. The painting was initially produced as an interior poster and was later adopted to the title.